Don’t miss out on this opportunity to discover the secret behind the famous Artificial Intelligence and the future of AI in Medical field. With the ever-changing nature of technology, emerged diverse and efficient ways of medical treatments these days; patient safety as well as medical quality also started to become a large part of medical development. According to a 2011 study in Transactions of the American Clinical and Climatological Association, Medical knowledge has been expanding way faster than anyone can imagine. While the doubling time was expected to be 50 years during 1950, it has accelerated to 17 months by 2018. Under an era of information explosion, no human could possibly comprehend and retain this much information. Therefore, Artificial Intelligence act as an indispensable role under this premise, and especially, the potential of future medical development and employment. 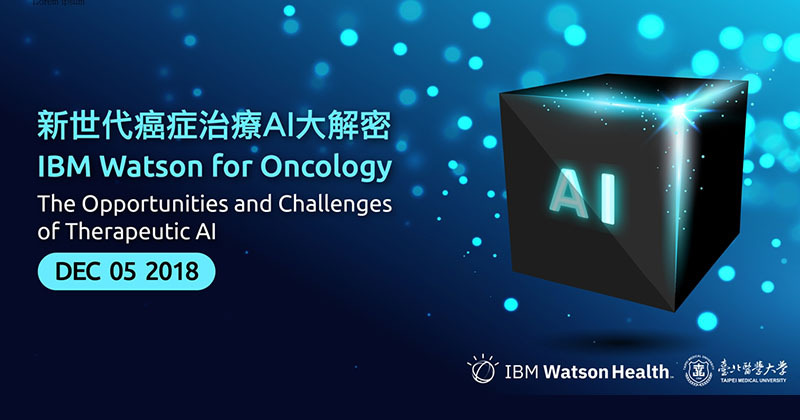 Taipei Municipal Wanfang Hospital (Taipei Medical University affiliated hospital) being the first hospital in Taiwan to adopt IBM Watson for Oncology, it’s our honour to have all the prestigious speakers from IBM and relative field to join the first “IBM Watson for Oncology” -focused conference in Taiwan. We will focus on how IBM Watson for Oncology can benefit patient/doctor for cancer treatment, and discuss the underlying challenges as well as potential development in the future. *Watson for Oncology combines leading oncologists’ deep expertise in cancer care with the speed of IBM Watson to help clinicians as they consider individualized cancer treatments for their patients. Watson for Oncology is a solution that is fueled by information from relevant guidelines, best practices, and medical journals and textbooks. The solution assesses information from a patient’s medical record, evaluates medical evidence, and displays potential treatment options ranked by level of confidence, always providing supporting evidence. The oncologist can then apply their own expertise to identify the most appropriate treatment options. The conference will be conducted in English, limited seats provided ,reserve your ticket now! VIMLA L. PATEL, PhD, DSc. Copyright© 2019 環球生技投資股份有限公司. All rights reserved.